Many families ask us about the need for a burial vault, wondering why it is necessary. It works like this. The casket encloses the body, and the outer burial container (known as a vault) encloses the casket, sustaining the weight of the earth and protecting it from the elements. 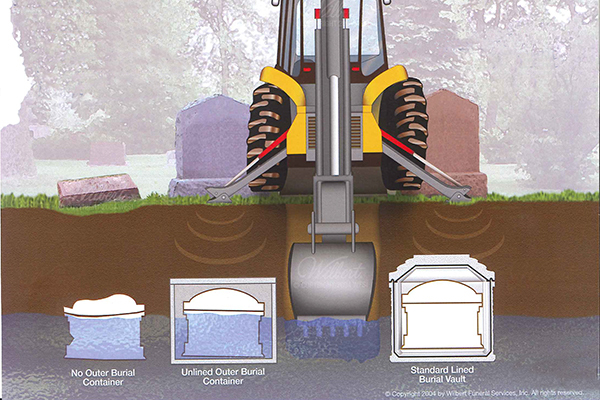 Most cemeteries require an outer burial container of some kind to protect the grave space from the settling earth and heavy machinery. Lined burial vaults provide the most protection to the casket. This example shows the impact of settling and machinery on a grave space with no vault, an unlined outer burial container, and a lined burial vault. To see a selection of vaults as well as our other services and merchandise, please talk to your funeral director or go to our Online Funeral Planner.